Presently vacuum spool-type aggregates (VSA) of production manufacturing firm "Nasosenergomash" (Sumy, Ukraine) are used in 95% cases for creation of preliminary (or required) vacuum in the power transformers’ tanks. Manufacturing firms, which make technological equipment for the power transformers, produce vacuum blocks so-called blocks of the preliminary rarefaction (BPR) by the productivity from 90 to 180 l/s on the base of these VSA aggregates. The same VSA blocks are also used in devices for drying the solid insulation, i.e. a preliminary vacuum is created in the transformer’s tank, and then for the acceleration of technological process highly productive Roots-type vacuum pump with two-lobed rotors comes online after the achievement of the fixed remaining pressure. the problem of exhaust gas cleaning is not solved though it is extremely important during work in enclosed space. All above-listed leads both to the rise in price of BPR block and considerably increase the operating costs. Since 2012 our company began mass production of preliminary rarefaction blocks named ELMO-BV vacuum blocks made on the base of vacuum pumps with the closed lubrication loop. Vacuum pumps are rotary blade fan centrifugal pumps with a rotor on roller bearing, a flange electric motor and automatic lube system. Vacuum pumps have low mass, sizes and power consumption. ELMO-BV blocks have a reliable mechanical construction and simple technical service. They are noiseless, with the low level of vibration and air-cooling. ELMO-BV blocks are intended for exploitation in the wide temperature range of environment and adapted for round-the-clock work. ELMO-BV vacuum blocks are in use in flowsheets, being all-sufficient equipment and can be used as vacuum pumps of the preliminary rarefaction coupled with Roots type vacuum pumps incorporating two-lobed rotors. Capacity of series-produced ELMO-BV blocks is 100, 150 and 180 l/s. Residual pressure is no more than 0.5 mbar (50 Pa). Capacity of ELMO-BV blocks with Roots type vacuum pumps is 250, 400 and 550 l/s. Residual pressure is no more than 0.05 mbar (5 Pa). Preliminary rarefaction block ELMO-BV-100 as independent equipment was tested for the first time at repair of transformer 500 kV on Samalut power substation in Egypt. 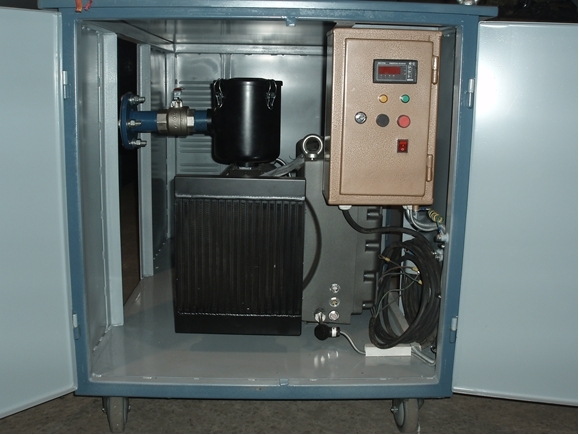 Due to compactness, small mass, low noise level and vibration and small power consumption block of preliminary rarefaction ELMO-BV-100 showed oneself from a positive side at the filling of transformer tank by oil. Furthermore, on the Samalut substation low-temperature single-block plant for preliminary drying the solid insulation of power transformers named ELMO-INEY was tested. The plant confirmed high service performance. 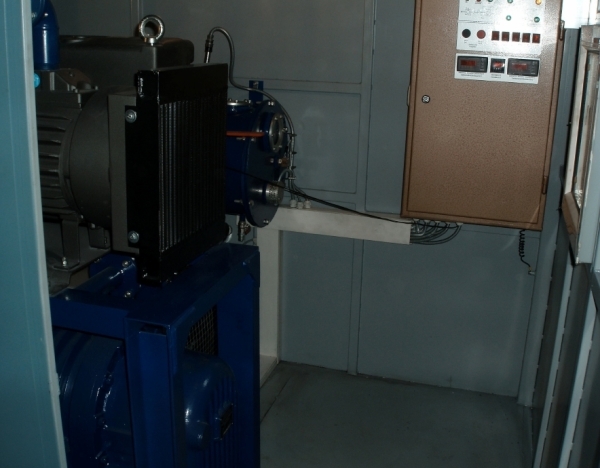 In this plant a vacuum pump of the preliminary rarefaction by the capacity of 100 l/s, that is 10% higher than at VSA-90, was mounted on a frame in common with a highly productive Roots-type vacuum pump by the capacity of 500 l/s. 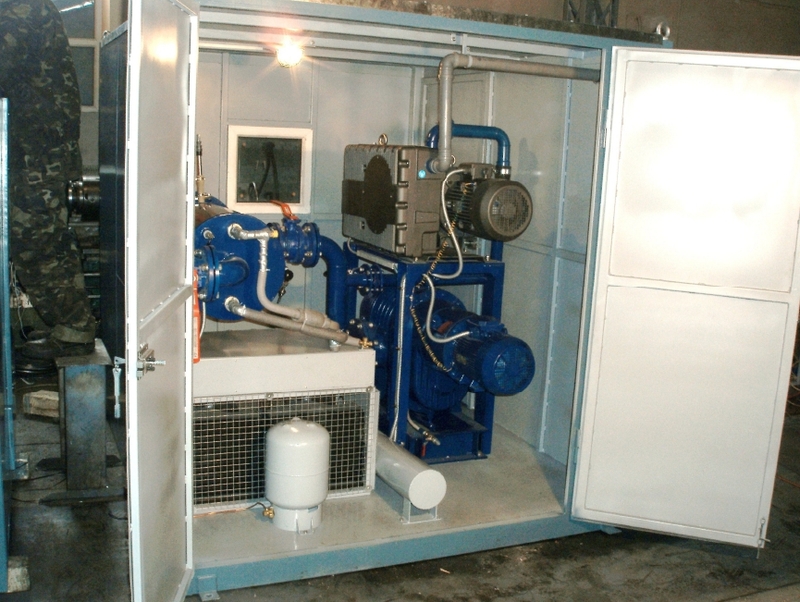 The frame was placed in a container together with a vacuum trap, low-temperature (-70oC) refrigeration machine, control panel, control and measuring devices etc. The container was mounted on a two-axle trailer. connection of plant to the transformer tank by a regular flexible stainless steel hose. An ambient temperature during work arrived at 40оС. ELMO-BV-100 and ELMO-INEY work performances surpassed all expectations of our specialists and chief-engineers from research-and-development center "ZTZ-service", Ltd.
air-cooled Roots-type vacuum pump (Q =500 l/s) is placed on the right below. ELMO-BV vacuum blocks are made in a protective metallic container with removable wheels.